With her long yellow hair and silky accessories, Shelly Seashore makes a splash wherever she goes. 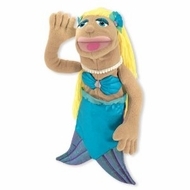 Top-quality materials and durable construction ensure that this hand-and-rod puppet will look great performance after performance. It's enjoyable for every skill level, too - the rod removes easily for beginners, then reattaches to either hand as hand-eye coordination and dexterity improve.